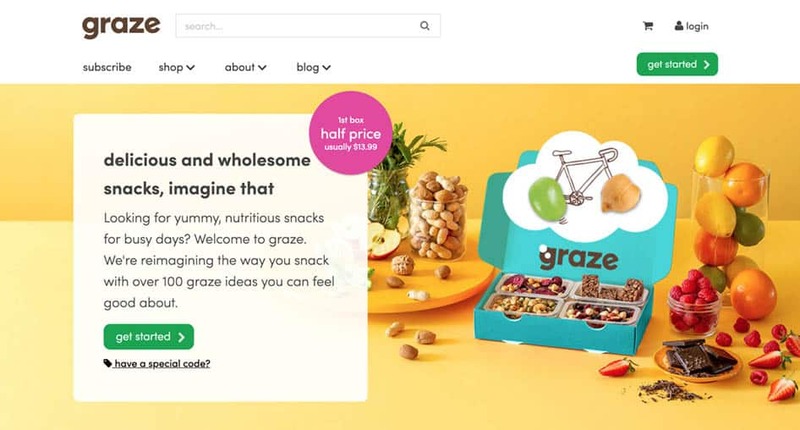 Graze Review: The Best Way To Try New Healthier & Tastier Snacks? Here at Food Box HQ, we’re always on the hunt for delicious, fun, and healthy snacks. So that’s why we were happy that we found Graze. Graze is a snack subscription service that believes you shouldn’t have to compromise when it comes to eating healthy. And you should be able to treat yourself to the things you really love, but in a better-for-you way. Simply put, they make healthier alternatives to the tastiest snacks around. Their snacks never contain artificial colors, flavors, or preservatives. Plus, they’re non-GMO. That means, you can feel good about the snacks you’re munching on from Graze. And not only that, but they have tons of variety—from nuts and seeds, sweet treats, savory snacks, and so much more that it would be pretty tough get bored with their offerings. If you’re ready to transform how you snack for the better, now is your chance! 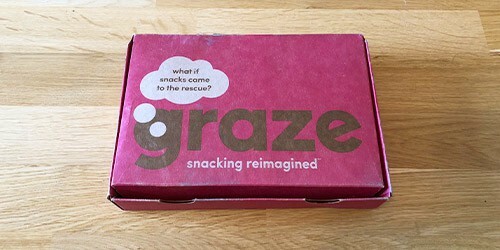 Read on to get the full scoop on Graze and how you can place your first order today! When ordering from Graze, you will have the ability to tell them what kind of snacks you’re interested in. Within the “food preferences” section of your account, you are able to let Graze know which snacks you’d prefer they didn’t send. For example, perhaps you’re not into coconut. No problem! You can go through their selection of snacks and exclude anything that contains coconut. This will really come in handy for picky eaters and those who are trying to avoid certain ingredients (e.g. gluten-free, dairy-free, sugar-free). When you do receive your first box, you’ll want to make sure you go online and rate the snacks you’ve received. By doing this, it allows Graze to see what you like and what you don’t like. Then, they can tailor your box to you even more. By rating a snack as “like” or “love,” it tells Graze that you want to receive this snack more often. With a “dislike” rating, you can feel good knowing you won’t receive that snack again. So, the more you snack, the more Graze will be able to understand what you enjoy and only send those types of snacks. Your first order will be their eight-snack box, which has eight snacks that are perfectly-portioned and ready for you to enjoy. If you sign-up with a special promotional code, however, you will only receive the sampler box with four snacks. 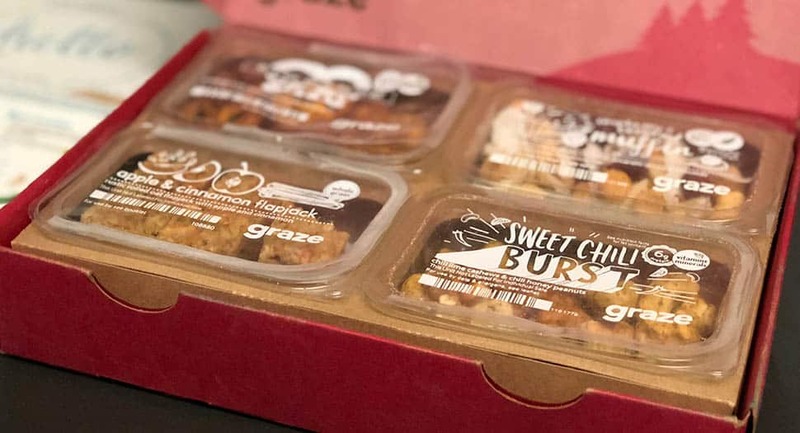 Either way, it’s a great opportunity to see what Graze is about and to give their snack selection a try. With Graze, you’ll be in control of how frequently you receive new orders. You can choose to receive a snack box every week, every two weeks, or every four weeks. 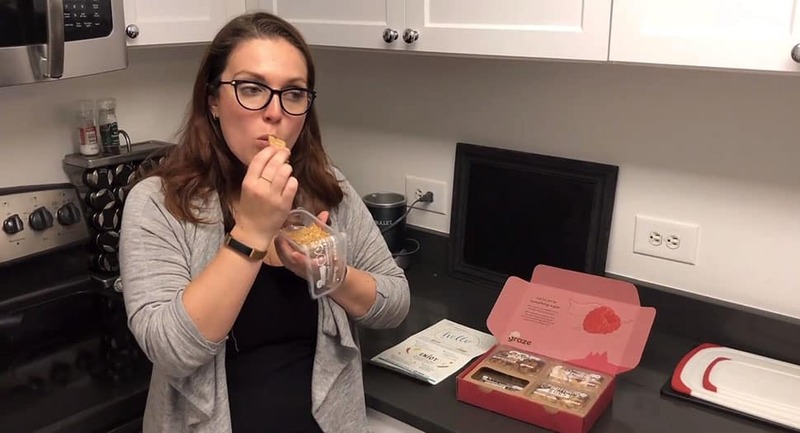 The fact that they allow you to control the frequency of boxes you receive is a huge plus, especially if your snack boxes will be feeding a family or even an office. If you’re not looking to subscribe to their service, that’s okay too. You can actually place one-off orders by browsing their online shop and adding the snacks you want to try to your shopping cart. This is a great option to have if you want to stock-up on favorites. As far as snacks are concerned, Graze has you covered when it comes to variety. There are an assortment of delicious flapjacks (basically like a granola bar), sweet snacks, protein-filled snacks, snacks that are perfect for dipping, nuts and seeds, and savory snacks. The flapjacks are definitely popular among Graze customers (based on other reviews, comments, and testimonials we’ve read). And we enjoyed ours immensely as well! One of the great things about them is that they’re really handy to eat and enjoy when you’re on-the-go. In terms of flavors, they offer a wide variety such as Apple and Cinnamon Flapjack, Pumpkin Spice Flapjack, Cocoa & Vanilla Protein Flapjack, Lemon Drizzle Flapjack, and more. If you’re someone who has more of a sweet tooth, you’ll love the selections Graze offers. You’ll find the Jelly Doughnut Multipack (raspberry fruit strings, almond slivers, raspberry-infused cranberries, and vanilla cookie drops), White Chocolate with Wild Blueberry Toasts, Wholegrain Banana Caramel Dippers, the Caramel Apple Multipack, and oatmeal Cinnamon Cookies and Tea Multipack. On the flip side, if savory is more your thing, Graze has you covered. You’ll find the Super Kale and Edamame Multipack, Louisiana Wile Rice and Beans Multipack, Protein Peanut Butter Dipper with Baked Pretzel Sticks, and many others. And if you’re looking to add a little extra protein to your afternoon snacking, try out their protein balls. It may sound weird, but trust me on this one, they’re delicious! High-protein snacks are the perfect way to stay energized through the day. The flavors they offer include Cinnamon and Cashew, Peanut Butter and Cocoa (my personal favorite), and Coconut and Cashew. With a variety like that, you’re sure to find something you’ll love. And you should have no trouble finding the right snacks to satisfy all of your cravings! Graze delivers their subscription boxes all over the 50 United States, including physical addresses and P.O. Boxes. They are, however, unable to deliver orders to APO, FPO, Guam, Puerto Rico, or US Territory addresses. As for shipping costs, there actually isn’t a fee for eight-snack boxes. However, you may be charged a $1 shipping fee if you order the four-snack sampler box. For shop orders, you will receive free standard shipping when you spend more than $20. If your order is less than $20, there will be a $4.25 shipping fee. Standard shipping is not available for Alaska or Hawaii though, but premium shipping is. You can expect four or eight-snack boxes to be delivered via USPS. Shop orders will be delivered by FedEx. You won’t need to be home in order to accept your Graze delivery because a signature is not required in order to leave your package. Also, there’s no need to worry about racing home to put your snacks away. Nothing needs to be kept cold or will spoil if left inside the box for a little while. 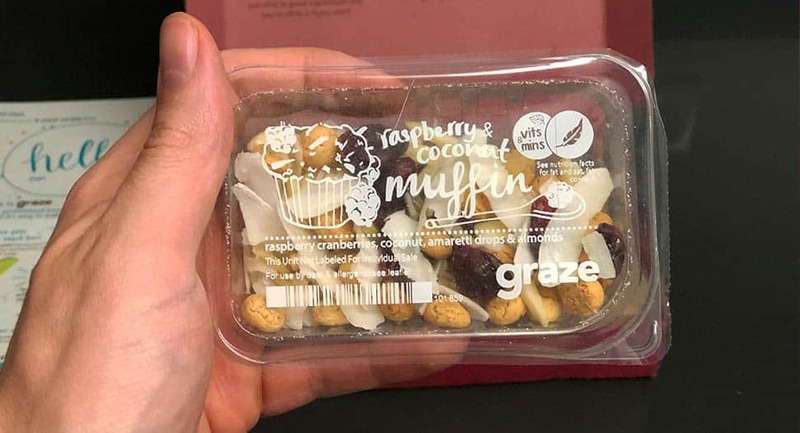 One of the great things about Graze is that much of the packaging they use is recyclable and they use their packaging as efficiently as possible. The cardboard box that houses your snacks is recyclable and can be left out with your regular recycling for the local curbside pick-up to get. The snack packs themselves are made from PET number 1 plastic, which is recyclable as well. The top layer that seals the snack package, however, is not recyclable because it’s a mixed plastic. Do keep that in mind when recycling all other packaging materials. All of the snacks you receive from Graze will be fresh and ready for you to enjoy. We had zero stale snacks or any that were anywhere near their expiration date. However, if you are concerned about the shelf-life of any snacks you receive, you can find the best by dates in the leaflet that comes with your order. For sharing bags, the best by date is on the back of the bag. But don’t worry, you don’t have to scarf all your snacks down right away. These snacks aren’t verging on expiration or anything like that. If you find any snacks were sent accidentally sent to you past their expiration, contact their customer support and explain the situation to them. They should be able to immediately resend a fresh batch of snacks or credit your account. All of the snacks we received in our boxes were 100% fresh. When it comes to Graze, there’s no denying that you’re going to get some pretty tasty snacks. If you watch our video review, you’ll see that we loved the snacks we got in our box. One of our favorites is the Apple and Cinnamon Flapjacks. It’s a hand-rolled, whole grain oat flapjack infused with apple and cinnamon — simple yet delicious. They’re the perfect on-the-go snack. As Emily says, “they taste like Fall”. Another favorite was the Sweet Chili Burst. They’re chili lime cashews and chili honey peanuts. To some this may seem a bit odd but they taste out of this world. In fact, I’m snacking on them as I write this review! And with 6 grams of protein, they’re the perfect snack for a little sustained energy. If you’re ready to get started with Graze, you’re probably wondering what kind of costs you’re looking at. Well, if you go with the eight-snack subscription box, it’ll cost you $13.99. And as mentioned, you can get those boxes every week, every two weeks, or every four weeks. If you’re ordering from the shop, prices are going to range. Most items are at the $8.99 price range, which gives you a six servings for the snacks you purchase. Overall, Graze is a great option for those who are on the hunt for some delicious snacks they can feel good about eating. I personally appreciate the fact that they never include artificial colors, flavors, or preservatives. They also never use any GMOs in their snacks. Also, Graze is great for those who are looking for more variety in their snacking. Their website algorithm actually learns what snacks you’re most likely to enjoy next, based on what you’ve already eaten and enjoyed. To be honest, this is one of the most futuristic ways to snack! Have you tried Graze? Have a question we didn’t answer? Leave a comment below and we’ll get back to you as soon as possible!